Holyoke Public Schools will begin awarding the Seal of Biliteracy to the students in the Class of 2019. The Seal of Biliteracy is an award made by the state department of education or local school district to recognize a student who has attained proficiency in English, as well as one or more additional languages, be that language a native language, heritage language, or a language learned in school or another setting. Biliteracy refers to having a functional level of proficiency in each language; the level of proficiency is not necessarily identical for both languages. Through the Seal of Biliteracy, the recognition of attaining biliteracy becomes part of the high school transcript and diploma for these students. The Seal serves to certify attainment of biliteracy for students, employers, and universities. 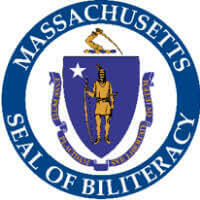 The Massachusetts state Seal of Biliteracy was established in November 2017 as a way to recognize graduates who speak, listen, read and write proficiently in another language in addition to English. Students qualify for the State Seal of Biliteracy when a senior has earned a 240+ on MCAS English, is in good standing and has met qualifications for graduation, and has taken and passed the Avant Assessment STAMP test at an intermediate high level in the areas of reading, writing, listening, and speaking. What does it mean to be at an Intermediate-High Level? Students who are at an intermediate-high level can sustain the States’s requirements for successful communication in the language domains of speaking, writing, listening, and reading. Speaking: sustain conversation in past, present, and future most of the time, using basic information related to work, school, recreation, particular interests, and areas of competence. Writing: write compositions and simple summaries related to work and/or school experiences, in past, present, and future, sometimes of paragraph length. Listening: understand, with ease and confidence, simple sentence-length speech in basic personal and social contexts. Reading: understand fully and with ease short, non-complex texts that convey basic information and deal with personal and social topics to which the reader brings personal interest or knowledge. Seal of Biliteracy insignia will be affixed to student diplomas as proof of biliterate attainment. Seal of Biliteracy recipients will be distinguished by a satchel or medal that will be worn over their graduation gown. Be the part of the first graduating class in Holyoke to receive the Seal of Biliteracy! For students who want to be a part of the first graduating class in Holyoke to be awarded the State Seal of Biliteracy, proposed testing dates are April 22nd, 23rd, 24th, & 25th (depending on the number of students being tested). The test is 45 minutes long (though a longer block of time may be granted). Take a moment to take the practice test here. Check out the flyer in English o en Español.